SEA LIFE Scheveningen gives you a unique glimpse into the amazing underwater life in our oceans. Stand eye to eye with sharks and rays. Learn more about turtles and dangerous piranhas. And meet the friendly otters and penguins in their lovely habitat. SEA LIFE has no less than 45 aquariums with marine animals and is open every day. 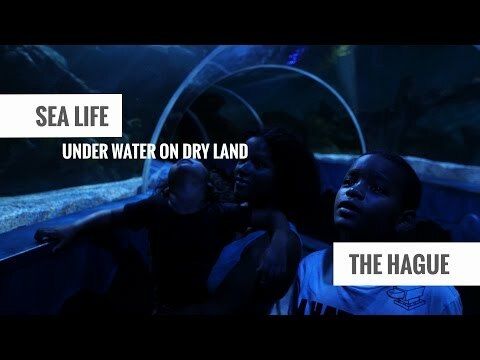 The indoor attraction also offers a varied outing for families with children aged from around 3 -11, even if it rains or the weather is bad in The Hague. Kids can watch the animals being fed each day and during the school holidays there are extra children's activities that can be attended free of charge. Located on the boulevard at Scheveningen, SEA LIFE is perfect for combining with a visit to the beach. That way, you'll turn a day away into a real sea day! Every day SEA LIFE has feeding sessions with different animals, which you can attend. You will receive the programme with the exact times at the entrance. A typical tropical experience is the underwater tunnel in SEA LIFE. Here you can experience what it's like to take a dive in tropical seas. Surrounded by sea animals and beautiful corals, you'll be amazed at the magical underwater world in which turtles and sharks swim above your head. Would you like to experience underwater animals close up? You can in the SEA LIFE interactive touch pool! Different underwater animals that live near the coast can be touched under the supervision of an employee. Feel a real starfish, hold a crab and learn all about these animals. SEA LIFE Scheveningen always provides a unique glimpse behind the scenes during the school holidays and weekends. During this tour, under the supervision of an employee you can visit the animal sanctuary, laboratory, kitchen and pump installations. Help test the water, see where the food is prepared and discover much more about the underwater world. (Caution: feeding animals is not part of the tour). A behind-the-scenes tour lasts approximately 45 minutes and is suitable for children aged 10 and over. Booking in advance is required (070-3542100), but it is also possible to register at the cash desk if places are still available. In addition to showing the beautiful world of the seas and oceans, SEA LIFE also works towards nature conservation. The attraction makes visitors aware of how important this is and regularly contributes to the conservation of sea life. In this way, SEA LIFE endeavours to ensure that the underwater world is not just on show in its aquariums, but that it can also be admired in the wild. SEA LIFE is open throughout the year. During the summer months of July and August opening times are longer. In the holidays and at weekends it can get busy between 12.00 and 15.00. Wheelchair users are therefore advised to visit the attraction outside these peak times. Dogs, with the exception of guide dogs, are unfortunately not permitted in SEA LIFE. Photographs may be taken but a flash must not be used. Tickets for SEA LIFE can be purchased in advance online via the website. Sealife.nl regularly offers great discounts and combination tickets to make visits less expensive. SEA LIFE discount vouchers are also available from the desk at VVV The Hague. Children under 3 have free entry. An average visit to SEA LIFE takes approximately 90 minutes, but the ticket is valid for the entire day which means that you can return later that day. The extra activities in the weekends and school holidays are free. SEA LIFE is surrounded by a host of other attractions in Scheveningen, such as the Pier, Museum Beelden aan Zee, the Circustheater and Holland Casino. The immediate vicinity of SEA LIFE offers a wealth of activities for young and old during every season. At the Netherlands' most famous coastal attraction, The Pier, you can visit a cosy market almost every weekend. After a refreshing walk along the beach, drop in at the restaurants and cafés on the boulevard and the year-round beach clubs to enjoy a delicious dinner with a view of the sea. The Pathé cinema, Circustheater and Holland Casino guarantee a great evening out in Scheveningen. The historic city centre of The Hague is only fifteen minutes from Scheveningen beach! SEA LIFE is located right on Scheveningen's Boulevard. If you're coming by car, once off the motorway, follow the signs for Scheveningen Bad. There are a number of car parks in the immediate vicinity. For further information on the best route, accessibility and parking in Scheveningen please visit denhaag.com/nl/scheveningen. SEA LIFE is also easy to get to by public transport. A number of trams and buses will take you from either train station in The Hague to Scheveningen in just quarter of an hour. Disembark at Kurhausplein, and you'll reach SEA LIFE in about five minutes. The entrance closes one hour earlier. SEA LIFE is open on Boxing Day (10:00 - 18:00), New Year's Eve (10:00 - 17:00) and New Year's Day (12:15 - 17:00).